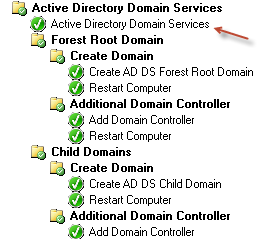 I've been working on a OSD task sequence to deploy Active Directory in a Windows 2012 environment for my current customer. They have many environments in production, and many more in the development, testing and quality assurance environments, so this is something they need to be automated and repeatable. The screen sot below shows the snippet of a larger task sequence that installs many different roles, features, and applications all in one task sequence. Variables assigned to the computer object when we provision the computer object in Configuration Manager drive what roles, features and applications get installed. I'm not going to show how that works here, but it may be something I explain in separate posts at some stage. The code above does not create an domain controller. It just installs the Active Directory Domain Services role. Other steps in the task sequence see the server promoted to be a domain controller. Including the 'IncludeManagementTools' option sees the appropriate management tools, and Windows PowerShell modules, get installed. This works on both the standard and core installations of Windows, with the installer being intelligent enough to know what to install base on what edition of Windows Server is being installed.